I just finished an interesting economics book that’s more comic book than textbook. 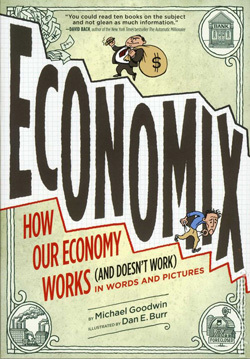 “Economix: How Our Economy Works (And Doesn’t Work)” is written by Michael Goodwin and brilliantly illustrated by Dan Burr. Goodwin does a great job tracing the history of the field of economics including the important contributions made by many different economists over the centuries, but the illustrations are the best part. Burr’s caricatures and comic book style turns “the dismal science” into something light, funny, and enjoyable to read. Economix would almost work as a textbook except for a few problems. One, its focus on the historical leaves it little time to help readers deeply understand some fundamental concepts of economics. It’s a better book to read for enjoyment after an introductory economics course. And two, Goodwin has a hard time hiding his bias. It’s funny when pokes fun of Calvin Coolidge, slightly annoying when he skewers Ronald Regan, and outright strange after page 199, where he states “…this book is about to get more controversial. So be it.” It does get controversial (or at least very one sided) and it becomes far less informative and fun to read.